Get the look of a contemporary jean in a sleek, fitted jegging made from classic stretch denim. 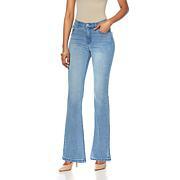 The 5-pocket style mirrors DG2 jeans, but this fabulous design eliminates the zipper and button fly. You get the comfort you want and a skinny jean silhouette in an easy, pull-on style. Win-win! Right on fit 1X for my 5'7" body...The waist band does not fold over. The length is perfect, and I like to fabric. I ordered the indigo and am pleased with the shade...They make you look slimmer and that's always a positive note. I now own 6 pair in this jean. The fit was so great I ordered more than 1. The price was great! Love these jeggings! Fit perfectly as always and are the most comfortable pants I have. Can't beat DG2s for stretch and style. I'll be living in these. Is there anything new to say about Diane's jeans? These run large. Exchanging for a size small...love that. Ill continue to purchase. 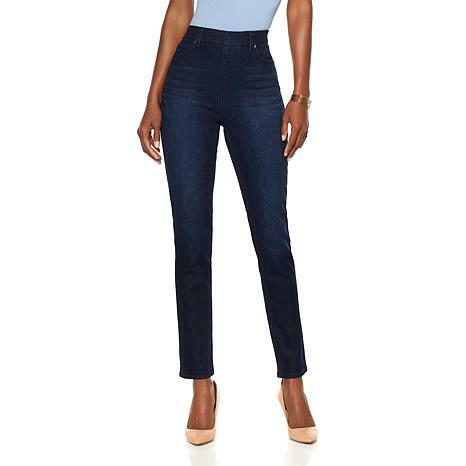 DG2 by Diane Gilman Mini Dot Embroidered Skinny Jean You'll be seeing spots this season, and Diane wasted no time in bringing you these mini dot virtual stretch denim jeans. Embroidery adds another trend-right touch to a pair packed with personality.